1. Preheat the oven to 220°C, gas mark 7. Roll the pork in the rosemary, then wrap it in the proscuitto, overlapping the slices. Cut the fillet into 4 pieces. Add 1 tsp oil to a medium roasting tin, add the pork and roast for 10 minutes. 2. Mix together 2 tsp oil, the beans, 2 tsp vinegar, the garlic and chilli flakes. Season and set aside. 3. Wash the broccoli, then while still damp place alongside the pork. Drizzle with the remaining oil. Roast for 8-10 minutes until the pork is cooked through with no pink meat. Cover and rest for 5 minutes. Then slice the pork. Mix any cooking juices with the sugar and remaining vinegar then season. 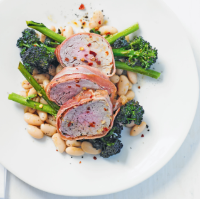 Serve the pork and broccoli on top of the beans with the juices spooned over and sprinkled with extra chilli flakes.